Indian football team captain and the current leading goal scorers in the world. ​The ace forward and captain of the Indian football team, Sunil is one of India’s greatest sportspersons ever. He is India’s highest-ever scorer, with fifty-one goals in ninety-one appearances. He was the chief architect of India’s wins in the Nehru Cup in 2007, 2009 and 2012, as well as the SAFF Championship and AFC Asian Cup in 2011. His seven goals in the 2011 SAFF Cup enabled him to surpass I.M. Vijayan’s record tally of six in a single edition of the tournament. Appointed captain of India in 2012, he led from the front in India’s third Nehru Cup win since 2007. 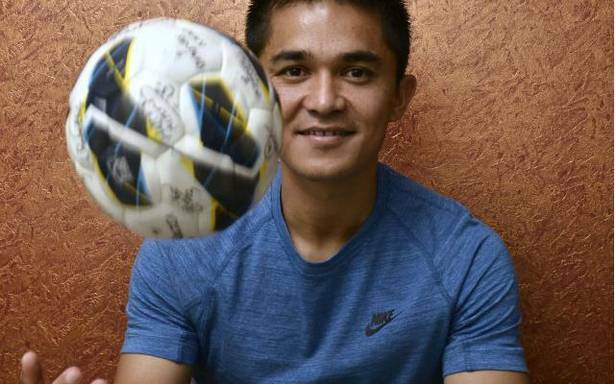 His consistency led to his being named AIFF Player of the Year on four occasions, in 2007, 2011, 2013 and 2014. He is the only Indian to have played in the Major League Soccer (USA) with Kansas City and Liga de Honra (Portugal) with Sporting Club de Lisbon. Presently playing for Bengaluru FC, Sunil has won two I-league titles and one Federation Cup in the last three years. In 2016, he was part of the Bengaluru FC outfit that created history by becoming the first Indian side to reach the final of the AFC Cup. Sunil is also the most expensive Indian auctioned in the Indian Super League, in which he represents Mumbai City FC.